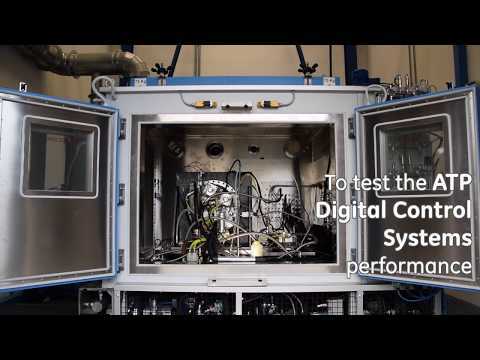 Tests are an essential feature of the development phase of aircraft engines. Without experimentation and testing, there would be no concrete, empirical evidence of engineering designs in terms of form, mechanics and performance. This also applies to the Advanced Turboprop (ATP, since last March 2018 officially renamed GE Catalyst), the clean-sheet engine for GE’s Business & General Aviation division (BGA), designed and produced in Europe, to power the Textron Aviation’s new Cessna Denali. In record time, the ATP is now very close to its first complete engine test, following experimental tests on its singular components, which have involved GE Aviation engineers in Germany, Poland, the Czech Republic and Italy over the last few months and throughout 2016. In particular, Avio Aero’s engineers, since that memorable November 2015 when development of the ATP began, have been working on the modules they are responsible for: the engine systems (including controls and software), the combustion system and both the power and accessory control boxes. Key components, featured by a high level of innovation and record setter for this class of aircraft. This is the case for the control and software systems that make the ATP the first “digital native” aircraft engine. The system designed by Avio Aero engineers is the first “Single Power Control Lever and Integrated Full Authority Digital Engine and Propeller Control” (FADEPC) ever made for a turboprop engine. “We started testing the control software for the very first time last April” explained Simone Castellani, ATP Controls, Fuel and Propeller Systems Engineer Manager at Avio Aero, who, along with colleagues from his team and from every other European team that worked on the ATP, is now in Prague for this key moment, meeting after months of hard work. During the FETT (First Engine to Test), in the test room of the GE Aviation plant in Prague where the first Advanced Turboprop has been assembled, they will finally be able to see the piece they have designed and planned in operation. “Back then we tested the operating logic of the engine system, assembling a hybrid, experimental engine, largely derived from GE's H80 and CF34 for the fuel system. Since November we finally have a real Wet Rig, or rather the test rig we use to test the engine brain with the real ATP components. ” It is this device (the FADEPC) mounted on the ATP that makes it a digital native engine, fully integrated thanks to an advanced system of sensors, cables an pipes that manage flows (of air, oil and fuel) by means of electrical and mechanically powered pulses from the power gearbox and the accessory gearbox. This complex system allows the intelligent control of propeller pitch, air in the compressor and fuel flow. Using just one command lever. “The Wet Rig verifies that the control system's ability to program and manage oil, fuel and air flows - from and to the engine - is reliable, accurate and in line with what we have designed,” continues Castellani. Real components, simulated environment. The power gearbox (PGB) and the accessory gearbox (AGB) are produced by Avio Aero and, among other things, the first is produced using additive manufacturing. “It’s the first time that the housing (Ed. the casing that encloses the two reduction stages in the gearbox), classified as a critical component, has been 3D printed by laser melting using a metal alloy powder that allows us to make thin, and therefore lightweight, parts” says Fabrizio Bussi, Gearbox Module Leader Systems Engineering. The power transmission housing is among the now famous 12 additive parts mounted on the ATP. In the case in point, this revolutionary production technique has integrated about ten parts made using the traditional method into one single part. Talking with the engineers working on the ATP makes you realize how GE Aviation’s cooperation network in Europe is brilliantly evolving in terms of operations. But for the Wet Rig, cooperation with those who built the facility in Brindisi was also critical, in an area where tests were previously carried out for the GE90 engine. “We have completely dismantled the building and worked with Avio Aero’s engineers to build what we needed: a virtual version of the entire engine, including real components, to test its performance in all flying conditions, combining the pilot’s input with current atmospheric conditions at different altitudes” explains Alessandro De Grassi, Technical Lead at Loccioni. The combustion chamber was tested in Pomigliano d’Arco in seven different configurations. “We planned and conducted thermo-fluid dynamic tests simulating high and medium pressure, and even sub-atmospheric conditions, testing engine performance at each operating phase: ignition, cruising, take-off and landing.” Francesco Gaudino is one of the most accredited figures when it comes to testing aircraft engines. He manages the Avio Aero team in Pomigliano, which works in the huge engine room at the Neapolitan site, where the GEnx is tested. Talking to ATP engineers, the impression one gets is that they cannot wait to ignite the entire engine as well.